Place a few of your potted plants at a fun and healthy display height using these Panacea Black Olde World Forged Pot Trivets. Resting a plant on a trivet keeps its base off of the cold ground, allowing better drainage from the base as well as air circulation fully around the plant. 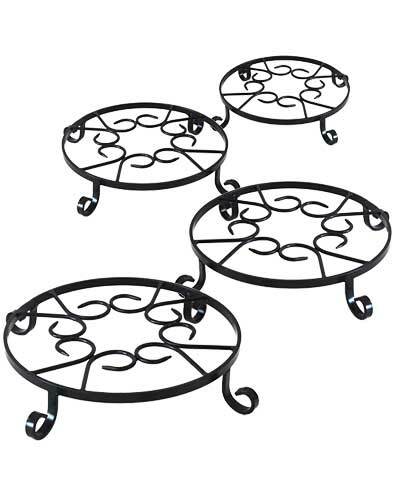 This set of four trivets is great for grouping a few plants on your patio or deck, or for elevating them in your sunroom. Several scrolls fill the top of each unit, creating a platform for an 11.5" diameter or smaller pot. Four slightly curved feet keep the trivets elevated 2.75" off the ground, and their charming curl matches that of the top scrolls. The black, powder coated finish keeps each item protected from the elements, and the steel construction remains durable for many seasons. Perfectly keep a few of your favorite flowers or herbs off of the ground using these Black Olde World Forged Pot Trivets. Note: This case pack includes 4 of the Panacea Olde World Forged Pot Trivets, Black, 12" diameter.